This splendid Missal with its majestic full-page Crucifixion and numerous large historiated initials represents the very peak of Gothic illumination at its apogee in France, which was itself the home of the Gothic style. The present manuscript stands out for its certain localization to the diocese of Soissons and for its exceptionally full cycle of illustrations. This splendid Missal with its majestic full-page Crucifixion and numerous large historiated initials represents the very peak of Gothic illumination at its apogee in France, which was itself the home of the Gothic style. The present manuscript stands out for its certain localization to the diocese of Soissons and for its exceptionally full cycle of illustrations. In her recent exhaustive study of Gothic illumination, A. Stones has identified the painter of our Missal as the Vincent Master after his primary production, a manuscript of Vincent of Beauvais's Speculum Naturale. She considers the liturgical books by this artist - especially the Soissons Missal - as "his most elegant products." Our artist collaborated frequently with the Gautier Master known for his contributions to a series of manuscripts containing the works of Gautier de Coincy. Leroquais records only five Missals of the same period with comparably rich cycles of pictures. This is certainly one of the finest thirteenth-century Missals still in private hands. 199 folios, in gatherings mostly of eight (i6 [of 8, blank 1-2 cancelled], ii2 [inserted bifolium], iii-iv8, v7 [of 8, 7 cancelled after f. xxii], vi-ix8, x7 [of 8, 7 cancelled after f. lxiv], xi-xxv8, xxvi5+4 [last originally blank, of 6, with a second blank cancelled, plus 2 inserted bifolia]), some alphabetical leaf signatures remaining, horizontal catchwords, medieval foliation in roman numerals at top of the rectos beginning at third gathering (omits xli and lvii, thus reaching clxxxix), written in dark brown ink in a formal gothic liturgical hand, ascenders of capitals occasionally with calligraphic faces, on 17 long lines, ruled in plummet (written space 230 x 150 mm. ), rubrics in red (a few remaining guidewords in a tiny cursive script), music on several pages on a 4-line red stave, one- to 3-line initials throughout in red or blue with fine penwork usually in the opposite color, 19 larger decorated initials in particolored red and blue with elaborate pen flourishing in both colors, 22 large historiated initials of up to 85 mm. square (average height of 66 mm.) in full colors and burnished gold with partial borders incorporating birds, faces, dragons, and hybrids, full-page miniature of the Crucifixion for the Canon of the Mass, prayers added at the end in an early sixteenth-century script, initials on ff. 68 and 132v partly smudged, vertical creases in some folios at the beginning, otherwise in very fine, fresh condition throughout. In a binding of mottled calf of c. 1800 with gilt borders and the gilt arms of the Prince de Ligne on front and back, spine with elaborate gilt decoration in each compartment and a red morocco label: MISSALE. Dimensions 334 x 220 mm. 1. The style of the decoration suggests a date of around 1250 to 1275, while the peculiarities of the text, especially within the Calendar and Sanctorale, indicate that the Missal was written for use in the diocese of Soissons, probably for a church dedicated to Saint Germain. The Calendar, which is ungraded and appears to be of secular use, includes the deposition of St. Drausinus (5 March, seventh-century bishop of Soissons), St. Onesimus (13 May, fourth-century bishop of Soissons), St. Medard of Soissons and his brother Gildard (8 June), and St. Principius (25 September, early sixth‑century bishop of Soissons). Except for Medard, these are all very rare and local feasts. The prominence of masses both for Saints Gervase and Protase (ff.132v-136v, with historiated initial) and for St. Blaise (ff.192-194v) is also telling, as the Cathedral of Soissons is dedicated to Saints Gervase and Protase and claimed to possess the relics of St. Blaise. Given just this evidence, it seems possible that the Missal was made for use in the Cathedral itself. But the unusual prominence of St. Germain of Paris (ff.129v-132v, also in the Calendar on 28 May) suggests, alternatively, that it was destined for a church or chapel dedicated to the founder of St. Germain-des-Prés; on f. 132 the Secret for St. Germain even refers to him as patron: . . . ut dum eorum merita recolimus, patrocinia sentiamus. 2. At the top of f. 160v in a semi-literate sixteenth-century hand is a partially smudged inscription beginning: mon petit . . . (drawing of a heart). 3. Upside-down in the lower margin of f. 197v is an erased inscription of which only a few letters are legible by ultraviolet light, possibly something like: L(iber?) de (. . . )lle donaemartis. 4. Prince Charles-Joseph de Ligne (1734-1814), bibliophile, diplomat, field marshal of Catherine the Great of Russia, correspondent of Voltaire, Rousseau, Goethe. The present binding was made for Charles-Joseph around 1800, and the manuscript was at the Château de Beloeil, Belgium, for nearly two hundred years before being sold by the present Prince de Ligne; London, Sotheby's, 18 June 1996, lot 61. 5. Bruce Ferrini, Akron, Ohio, and Les Enluminures, Paris and Chicago, published in Important Illuminated Manuscripts, by Margot MacIlwain Nishimura, introduction by J. J. G. Alexander, Paris, Chicago, and Akron, 2000, no. 15, pp. 80-85. 6. Elizabeth and James Ferrell, Private Collection, USA. 7. Los Angeles, The J. Paul Getty Museum, long-term deposit from 2004-2017. The Missal combines in a single volume all the various components for the performance of the Mass (including chants, prayers, and readings from the Bible). It was introduced as early as the Carolingian period, but prior to the thirteenth century most of its components had circulated in individual manuscripts, such as the Sacramentary, Gradual, and Gospel Lectionary. Thus, the present manuscript can be viewed as one of the earliest witnesses to a text that still has widespread application. It is also remarkable for its complete original text, a status not at all common among medieval Missals, presumably because they were in constant use and subject to being adapted to changes in local liturgies and the peregrinations of their owners. ff. 172-198, Other Masses, beginning with the Mass of the Holy Cross (Nos autem gloria . . . ), followed by the Nuptial Mass (f. 176v, including a blessing of the bridal couple), a Mass over a dead body (f. 181), a Mass for the priest himself (f. 185v), a Mass for when a member of the congregation dies (f. 186), for a person who has died recently (f. 186), for a bishop (f. 186v), for a woman (f. 187), for the anniversary of a death (f. 187v), for one's mother and father (f. 187v), a general Mass (f. 189), for those buried in the cemetery (f. 189v), and for all faithful departed (f. 190), originally ending on f. 191v, . . . et exhortare, In xpisto ihesu domini nostro; with a contemporary continuation on slightly different ruling for St. Blaise (f. 192), and, slightly later again, for the Holy Sacrament (f. 195), all ending on f. 198, . . . perceptio prefigrat, Per domium nostrum. Alison Stones has identified the artist responsible for this manuscript as the Vincent Master (active Northeast France, c. 1260-90). Named for his illuminations in a grand series of manuscripts of Vincent of Beauvais's Speculum Naturale (Mirror of Nature) in Laon (Bibl. Mun. MS 426) and in Paris (BnF, MS lat. 6428c), the Vincent Master was active in the late thirteenth century in northeastern France, particularly in Soissons. This name is misleading, however, because the artist's best work appears in two exquisite liturgical books (according to Stones: "his most elegant products"): the Pontifical of Châlons-sur-Marne (Bibl. mun., MS 45) and the "majestic" full-page Crucifixion miniature of the present manuscript, the Soissons Missal. In both cases the bright colors and minute patterns stand out, especially in backgrounds and borders. Known to be active in at least four cities, including Soissons, Noyons, Laon, and Châlons, and to have collaborated with many artists, the Vincent Master was probably an itinerant painter (Stones, 2013, I, v. 2, p. 489). His most frequent collaborator was an artist identified by Stones as the Gautier Master after his illumination of two copies of Gautier de Coincy's Miracles of the Virgin (Paris, BnF., MS 25532, and St. Petersburg, NLR, Fr. F. v. xiv.9). Both artists also participated in the illumination of the Gaudal of Vauclair (Laon Bibl. Mun. 241), the Pontifical of Châlons-sur-Marne cited above, and a manuscript of Papias, Vocabularium (Valenciennes Bibl. Mun. 396). The manuscript has one full-page miniature and 22 large historiated initials, among which two distinct styles can be discerned. Five of the smaller historiated initials betray the influence of Paris in their bright crisp colors, similar to those of stained glass windows, set against highly burnished, shimmering gold grounds (ff. 24v, 28v, 132v, 140v and 159). The remaining miniatures are much closer to the contemporary style associated with French Flanders, especially the area around Cambrai, Lille, and Arras, and linked with the patronage of Nicolas des Fontaines, bishop of Cambrai (1248-1273). The figures are slightly more volumetric and the colors less bright, with orange, purple-gray, a muted blue and rose predominant; and the scenes are set against backgrounds of blue or rose diaper, rather than burnished gold (see A. Stones, The Minnesota Vincent of Beauvais Manuscript, Minneapolis, 1977; W. B. Clark in Speculum 50, 1975; A. von Euw and J. M. Plotzek, Die Handschriften in Sammlung Ludwig, vol. 1, 1979, pp. 280-284). Attached to all the historiated initials are partial borders, usually the whole height of the page, of blue, rose and gold bars with ivy-leaf finials and short foliate extensions into the upper and lower margins. f. 159, Historiated initial "G" with All Saints. 1. Paris, Bibl. Sainte-Geneviève MS 90, second half of the thirteenth century, 22 historiated initials (including some added later). 2. Clermont-Ferrand, Bibl. Mun., MS 62, probably made for Hughes Aycelin (d. 1297), 25 historiated initials. 3. Sens, Bibl. Mun., MS 18, first half of the thirteenth century, 26 historiated initials. 4. Paris, Bibl. Sainte-Geneviève, MS 102, thirteenth and fifteenth century, 34 historiated initials. 5. Auxerre, Cathedral Treasury, MS 8, ca. 1300, 48 historiated initials. 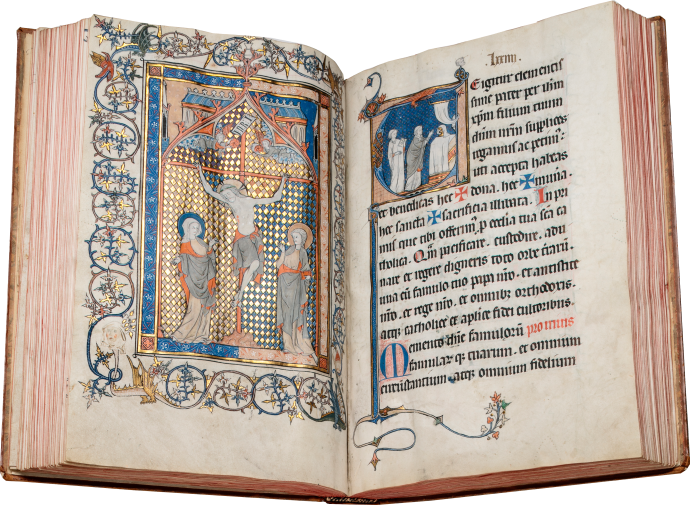 Only two other significant thirteenth-century missals have appeared on the market in the last forty years, and the present missal is much more spectacularly decorated than either (London, Sotheby's, 25 March 1975, lot 2945; and New York, Christie's, 2 December 1987, lot 151). We do not know the original patron of the Soissons Missal, but he must have been someone of considerable wealth and stature, given the scale and importance of the manuscript he commissioned. Alison Stones, Gothic Manuscripts: 1260-1320. Parts One and Two (Survey of Manuscripts Illuminated in France), 4 vols., Turnhout and London: Brepols and Harvey Miller, 2013, pp. 68, 479-490, figs. 683-705. Anton von Euw and J. M. Plotzek, Die Handschriften in Sammlung Ludwig, Cologne, 1979-1985, vol. 1, 1979, pp. 280-284.